By a vote of 93 to 6, the U.S. Senate passed the FAA Reauthorization Act of 2018 on Oct. 3, which President Trump expected to sign during a White House ceremony on Oct. 5. The legislation provides a five-year authorization of federal aviation programs that includes reauthorizations and reforms of the Transportation Security Administration and the National Transportation Safety Board, while overhauling federal disaster programs. “This bill creates five years of stable policy direction for the aviation community,” noted Sen. John Thune, R-South Dakota, in a statement. Thune also serves as chairman of the Senate Commerce, Science, and Transportation Committee and initially proposed FAA reauthorization legislation in the Senate last year. The bill was updated, changed, and reconciled on Sept. 28 with a similar measure passed by the House of Representatives. The FAA bill’s amended text, filed in the House as H.R. 302, passed by a vote of 398 to 23. The House also passed an FAA extension bill dubbed H.R. 6897 that funds the FAA through Oct. 7 to give the Senate more time to vote on the measure and have President Trump sign it into law. More than $1 billion is authorized annually for fiscal years 2018-2023 for supplemental airport discretionary grants, with half of those funds earmarked for smaller airports. Airport Investment Partnership or AIP funds through fiscal year 2023 can now be used to fund the development of certain airport access roads in noncontiguous states and for certain snow removal and safety equipment storage facilities. Reforms of the FAA’s Zero Emissions Vehicle pilot program, clarifying that airports have the option to use AIP or Passenger Facility Charge or PFC funds for projects within those programs. USDOT is also authorized to establish a zero-emission airport technology development program to “facilitate” the development of commercially viable zero-emission airport vehicles. Directs the NTSB to establish and maintain a multi-modal accident database management system for the agency’s investigators, similar to the existing database of aviation accidents, in order to improve the quality of accident data the NTSB makes available to public and the selection of accidents for investigation. 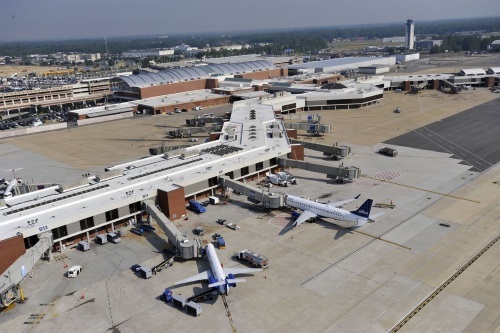 The USDOT is ordered to engage an independent nonprofit research organization to conduct a study assessing the infrastructure needs of airports and existing financial resources for commercial service airports and make recommendations on the actions needed to upgrade the national aviation infrastructure system to meet the growing and shifting demands of the 21st century. The Disaster Recovery Reform Act of 2018 or DRRA, included within the FAA bill, aids states affected by wildfires with hazard mitigation assistance and allows said hazard mitigation assistance to be used for activities that help reduce the risk of future damage, hardship, loss, or suffering in any area affected by a wildfire, windstorm, or earthquake. It also amends the Stafford Act to modify the federal government’s pre-disaster hazard mitigation program to ensure investments are made before disaster strikes to minimize loss of life and reduce disaster costs. The DRRA also directs the Administrator of the Federal Emergency Management Agency to develop incentives that would encourage state, local, and tribal governments to “close out” expenditures and activities on a timely basis related to disaster or emergency assistance. The reconciled legislative package – which includes the FAA Reauthorization Act of 2018, the DRRA, a three-year reauthorization of TSA and a four-year reauthorization of the NTSB – also provides a “disaster-preparedness” focus for transportation infrastructure, Shuster stressed at AASHTO’s annual meeting. Shuster also noted that the FAA bill integrates unmanned aerial vehicles or UAVs – commonly called “drones” – more formally into the U.S. air space system. “They are here, they are coming, and we need to figure out how to manage our air space with them in it,” he said.